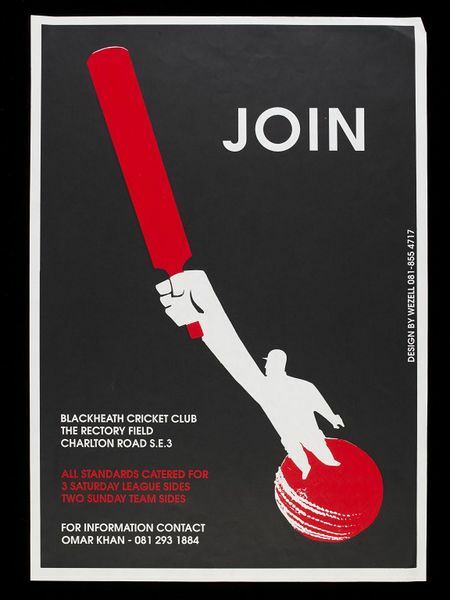 Community print shop poster encouraging people to join Blackheath Cricket Club. A single figure of a player is depicted in white against a black background with a white border, standing on a red cricket ball and holding along a large red cricket bat. The address and contact information is lettered in capitals in red and white in the bottom left, and the name and telephone number of the designer is lettered up the side on the right. 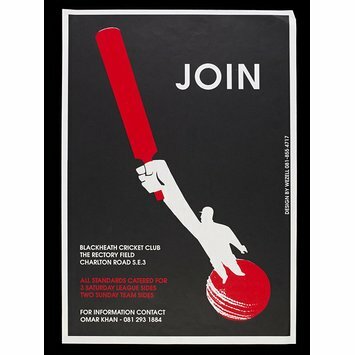 Community print shop poster by Wezell at the Greenwich Mural Workshop entitled 'Join Blackheath Cricket Club'. Great Britain, ca. 1984-93.